Who uses NASA Earth science data? Dr. Piyush Agram, for developing Synthetic Aperture Radar (SAR) data products. Dr. Agram in his JPL office. On his computer screen is an interferogram created from SAR imagery showing changes in land elevation following earthquakes that occurred on April 14 and 16, 2016, at the southern tip of Japan. Each colored fringe in the image represents a change in elevation between April 8 (pre-quake) and April 20, 2016 (post-quake). Screen image uses Copernicus Sentinel data 2016, processed by the European Space Agency (ESA). Research interests: Developing algorithms for processing data from the upcoming joint NASA/Indian Space Research Organization (ISRO) NISAR mission; developing new techniques for using and interpreting Synthetic Aperture Radar (SAR) and Interferometric SAR (InSAR) imagery. Research highlights: SAR is an amazing remote sensing technology. It can create high-resolution images 24/7 regardless of weather and can penetrate through dense forest canopy to reveal underlying ground features. Plus, it can be used to precisely measure changes in land elevation, such as after an earthquake or volcanic eruption. For detailed environmental monitoring and resource mapping, SAR is an instrument of choice. NASA put the first civilian SAR in space with the launch of Seasat in 1978. Now, NASA, in collaboration with ISRO, is preparing for one of the most sophisticated SAR missions ever to orbit Earth: the joint NASA/ISRO SAR (NISAR) mission. 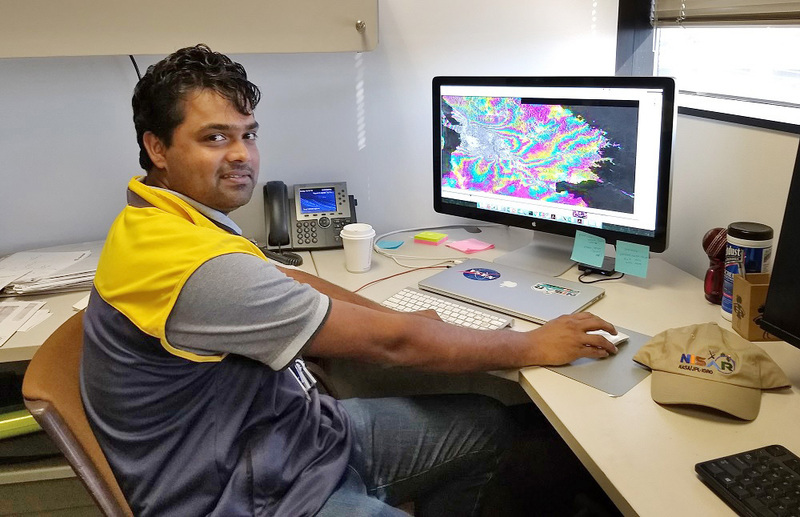 The vast array of science data products created from NISAR mission data will be thanks, in part, to the work and contributions of Dr. Piyush Agram and his colleagues in the Radar Algorithms and Processing Group at NASA’s Jet Propulsion Laboratory (JPL) in Pasadena, CA. NISAR is tentatively scheduled to launch in late-2021 and will put into Earth orbit two powerful SAR systems designed to collect data about natural hazards and global environmental change. The volume of data collected by NISAR is expected to be greater than any previous NASA Earth observing mission—as much as 85 terabytes (TB) of data each day (for perspective, the Hubble Space Telescope generates roughly 10 TB of new data each year, according to NASA). The total volume of data generated by NISAR over its planned three-years of science operations could be as high as 140 petabytes (PB). For a sense of how much data this represents, NASA’s Earth Observing System Data and Information System (EOSDIS), which is responsible for Earth observing data in the NASA collection, currently has a total archive volume of a bit more than 26 PB. (For a look at how NASA’s Earth Science Data and Information System [ESDIS] Project, which manages the data in the EOSDIS collection, is preparing to handle NISAR data, please see Getting Ready for NISAR—and for Managing Big Data in the Commercial Cloud on the Earthdata website). NISAR data, though, will be merely strings of numbers unless they can be turned into standard data products with the quality assurance, validation, and processing required for use in scientific research. This is where Dr. Agram and his colleagues come in. Dr. Agram is part of the NISAR Algorithm Development Team (ADT), which is responsible for developing and validating algorithms that will be used to process data from NISAR’s L-band SAR, which is being developed by NASA. The second SAR system aboard the spacecraft is a S-band SAR that is being developed by ISRO. Having two SARs operating at two different wavelength bands (L-band and S-band) will facilitate in-depth studies of natural processes ranging from flow rates of glaciers and ice sheets to landform changes caused by earthquakes, volcanoes, and human action. And SAR is a technology perfectly suited to this task. SAR image of the Fraser River in British Columbia, Canada. This image was acquired during NASA’s Shuttle Imaging Radar-C (SIR-C) mission conducted in 1994. NASA’s home for SAR data and imagery is the Alaska Satellite Facility Distributed Active Archive Center (ASF DAAC). SAR is an “active” radar system, and collects data by bouncing a microwave radar signal off a surface to detect physical properties (“passive” radar systems, such as a radiometer, sense radiated energy and do not send out a radar pulse). Since SAR relies on reflected microwaves to create imagery, it does not need illumination from an outside source (such as the Sun). In addition, the wavelengths used for creating SAR imagery can penetrate clouds, smoke, soil, ice, and tree canopies. This allows high-relief SAR imagery to be created day or night, rain or shine across all biomes. The SAR radar wavelength determines the penetration depth of the transmitted signal; the longer the wavelength, the deeper the penetration. The 24-cm wavelength of NISAR’s NASA-provided L-band SAR can penetrate soil, ice, and dense tree canopies. The 12-cm wavelength of NISAR’s ISRO-provided S-band SAR can penetrate light vegetation, but is unable to penetrate as far as L-band. As noted in the NISAR Science Users’ Handbook, while the L-band SAR will be used for global radar imaging, the S-band SAR will be used for more targeted radar imaging, primarily over India. In addition, NISAR’s L-band and S-band systems can be operated simultaneously. 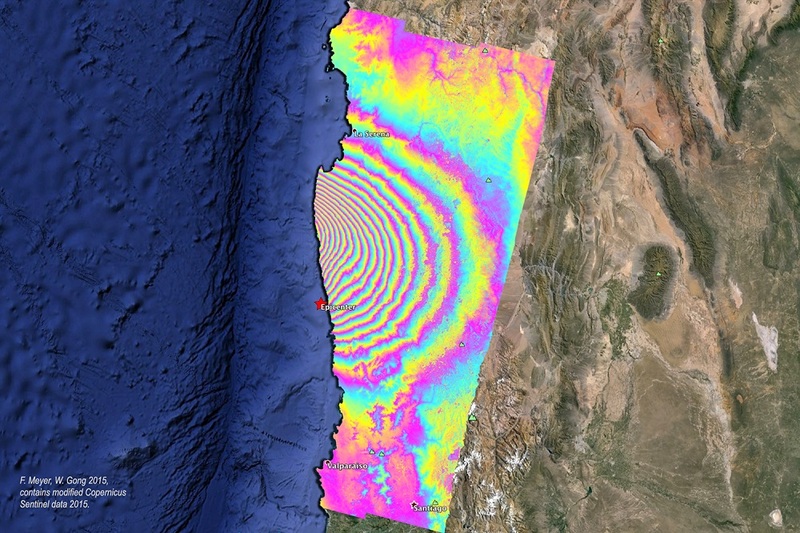 Interferogram showing land displacement following a September 16, 2015, earthquake in Chile. ASF DAAC scientists used SAR data acquired from the ESA Sentinel-1A mission before and after the quake to create this image. One complete color cycle represents a relative line-of-sight motion of 8.5 cm. This image is combined with a Landsat image in Google Earth (© 2015 Google). Image credit: F. Meyer, W. Gong 2015; contains modified Copernicus Sentinel data 2015. ASF DAAC distributes the complete historical archive of ESA-processed Sentinel-1A SAR data. One NISAR science objective is to study minute (mm- to cm-scale) changes in landforms caused by natural events (such as the rise or fall of land following earthquakes or volcanic eruptions) or human actions (such as land subsidence due to agricultural drawdown of water from aquifers). By looking at multiple SAR images of the same area captured days, weeks, months, or even years apart, precise elevation changes can be mapped and calculated. This technique, called interferometry, uses interferometric SAR (InSAR) images to depict land elevation changes as colored fringes in an image called an interferogram. An interferogram shows where land elevation is changing and the amount of elevation change. NISAR is the continuation of civilian space-based SAR observations that began with the launch of NASA’s Seasat satellite in 1978 (which carried a L-band sensor). NASA built upon Seasat with a series of SAR missions aboard early flights of the Space Shuttle. These were designated Shuttle Imaging Radar (SIR), missions, and flew aboard the Space Shuttle in 1981, 1984, and 1994 (two missions). 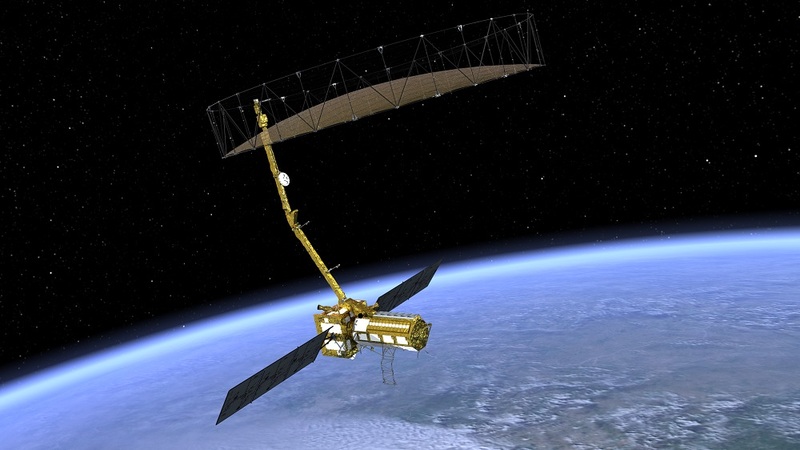 In 2000, NASA and the National Geospatial-Intelligence Agency participated in the international Shuttle Radar Topography Mission (SRTM), which included a C-band (5.6-cm wavelength) SAR (which was operated by JPL) and a X-band (3.1-cm wavelength) SAR (which was operated by the German and Italian space agencies). SRTM data were used to produce extremely accurate digital elevation maps covering nearly 80 percent of the planet. Dr. Agram notes that almost all the SAR data he works with are distributed by NASA, primarily through the Alaska Satellite Facility Distributed Active Archive Center (ASF DAAC). ASF DAAC is responsible for SAR data in NASA’s collection, which includes data from NASA orbital missions (such as Seasat) as well as airborne SAR missions such as the Airborne Synthetic Aperture Radar (AirSAR) mission (operational 1990 to 2004). ASF DAAC also has agreements to distribute SAR data from international missions including the European Space Agency’s Sentinel-1 mission, the Japan Aerospace Exploration Agency’s Advanced Land Observing Satellite-1 (ALOS) mission, and the Canadian Space Agency’s Radarsat-1 mission. ASF DAAC eventually will archive and distribute NISAR data. Artist’s rendering of the NISAR spacecraft. The large circular object on the boom above the main satellite bus is the radar antenna reflector. NISAR will have an approximately 464-mile orbital altitude and provide repeat global coverage every 12 days. NASA JPL-Caltech image. To prepare for the enormous influx of data from NISAR, ASF DAAC is working in collaboration with JPL on a project called Getting Ready for NISAR (GRFN. Dr. Agram supports GRFN through his work creating sample interferometric products as part of JPL’s Advanced Rapid Imaging and Analysis (ARIA) Project for Natural Hazards. These sample InSAR products are designed to help the science community prepare for working with similar products from NISAR. Dr. Agram’s NISAR support also includes his work as part of the team that developed the InSAR Scientific Computing Environment (ISCE) software, which will become the processing software for NISAR. In addition, Dr. Agram developed the Generic InSAR Analysis Toolbox (GIAnT), which will be used to generate NISAR Level-3 Solid Earth Deformation Time-series products. As Dr. Agram observes, his work enables work by other scientists. The algorithms he is developing and testing for NISAR, along with his work preparing the science community to use NISAR data, will contribute greatly to the research conducted using data from one of the most advanced radar systems ever put into Earth orbit. Fattahi, H., Agram, P. & Simons, M. (2017). “A network-based enhanced spectral diversity approach for TOPS time-series analysis.” IEEE Transactions on Geoscience and Remote Sensing, 55(2): 777-786 [http://doi.org/10.1109/tgrs.2016.2614925]. Fattahi, H., Simons, M. & Agram, P. (2017). “InSAR Time-Series Estimation of the Ionospheric Phase Delay: An Extension of the Split Range-Spectrum Technique.” IEEE Transactions on Geoscience and Remote Sensing, 55(10): 5984-5996 [http://doi.org/10.1109/tgrs.2017.2718566]. Podest, E. (2017). “Basics of Synthetic Aperture Radar (SAR).” NASA Applied Remote Sensing Training (ARSET). PowerPoint presentation, November 29, 2017. Available online at https://arset.gsfc.nasa.gov/sites/default/files/water/Brazil_2017/Day1/S1P2.pdf. Agram, P. & Simons, M. (2015). “A noise model for InSAR time series.” Journal of Geophysical Research: Solid Earth, 120(4): 2752-2771 [http://doi.org/10.1002/2014jb011271]. Rosen, P.A., Gurrola, E., Sacco, G.F. & Zebker, H. (2012). “The InSAR scientific computing environment.” Presentation at EUSAR 2012; 9th European Conference on Synthetic Aperture Radar, April 23-26, 2012, Nuremberg, Germany. Available online at https://ieeexplore.ieee.org/document/6217174/authors. Explore more Data User Profiles.